We are having a discussion at our facility about whether the Biopatch should be applied at the time of PICC insertion or at the 24-48 hour dressing change. Any information would be appreciated. We haven't started using BioPatch yet. We will in the next month. Our plans are to use on insertion and if saturated, a 24 hour dressing change would be needed. Based on our observation, we think that we will not need the 24 hour dressing change. We will see if that observation is right, once we start usimg them. We have been using Biopatch on insertion for approximately 4 years now. If we insert a PICC and the site is oozing, we will then apply the gauze dressing and then require the 24 hour dressing change, however this is rare. 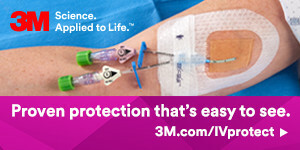 Using Biopatch on insertion, decreases cost and nursing time since the 24 hr dressing change is not required. Also, your QA's for missed 24 hr PICC dressing changes will be non existent. Can you tell I totally support this? Merry X-Mas!!! I worked at a hospital here in Connecticut that instituted application of a Biopatch upon PICC insertion about 2 years ago. They have had great results. However the policy and practice there is to apply the Biopatch, covered with a pressure gauze then a transparent dressing. The PICC team then still does the initial dressing change in 24 hours- applying a new Biopatch. Personally, I thought this was a waste of the Biopatch as it can stay in place 7 days. But this brings up an interesting point. If a Biopatch is applied on a PICC site under a gauze dressing- then does the dressing have to be changed in 24 to 48 hrs? I don't think it is necessary. But then there is the INS standard for gauze dressing changes. I would feel it is best to apply the Biopatch with an initial transparent dressing without as others are doing. OR apply initial pressure dressing, and upon 1st dressing change apply a Biopatch. We have used Bio-Patch with excellent results since January last year. If the decrease in infection rates is not enough to satisfy inquiring minds, the cost of using Bio-Patch at the time of insertion is usually less then doing the 24 hour dsg change. We are doing dsg changes every 7 days unless otherwise indicated. We trialed the Biopatch a couple of years ago and had a bump in yeast related blood stream infections. Our ID folks thought it might be the patch, incorrected placed. Did anyone have a similar experience? We are going to try it again in February 07. I would defininitely be interested in applying it at the time of insertion. I am curious to know how did they think it was incorrectly applied? Chlorhexidine specifically inhibits yeast growth. I have had a couple patients develop contact dermatitis under their picc dressings which then developed into yeast skin infections and the only place they didn't have impaired skin was under the biopatch at the insertion site.